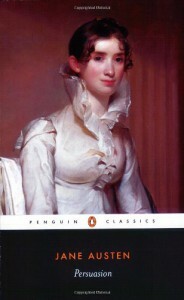 I read “Persuasion” on a wave of enthusiasm for Jane Austen created by reading “The Jane Austen Project”. I’d never read the book before and knew nothing of its plot or its ending. I found that this ignorance significantly enhanced my enjoyment of this book about lovers frustrated by circumstance and the things that they have persuaded themselves of or have been persuaded of by well-meaning advisors.. Some of the novel is set in Bath, a city I lived in for many years, so I was amused to see references to streets that apart from the addition of traffic signs and double yellow lines, have remained unaltered since Jane Austen’s time. I used to live in the building occupied by the baddy of the plot. It was great fun to imagine these familiar streets populated by Regency sailors and a ladies so unused to exercise and so bound up in corsets that walking up Milsom Street was an achievement. The story itself is rather unremarkable but achieves a considerable level of engagement in the lives of the protagonists for a plot built on so slight a premise. I enjoyed myself immensely and am now encouraged to move on to the rather more substantial “Emma”.